These projects are for components of the OpenSS7 SIGTRAN stack. Each component is tracked under a separate project. Click on any of the components in the diagram or listed below to see project information relating to the desired component. The BUA project is to provide a Bearer Independent Call Control (BICC) User Adaptation Layer (BUA) STREAMS multiplexing driver which will provide the BUA protocol modules. The ISUA project is to provide an Integrated Services Digital Network (ISDN) User Part (ISUP) User Adaptation Layer (ISUA) STREAMS multiplexing drvier which will provide the ISUA protocol modules. The TUA project is to provide a Transaction Capabilities Application Part (TCAP) User Adaptation Layer (TUA) STREAMS multiplexing driver which will provide the TUA protocol modules. The SUA project is to provide a Signalling Connection Control Part (SCCP) User Adaptation Layer (SUA) STREAMS multiplexing driver which will provide the SUA protocol modules. The M3UA project is to provide a Message Transfer Part (MTP) Level 3 User Adaptation Layer (M3UA) STREAMS multiplexing driver which will provide the M3UA protocol modules. 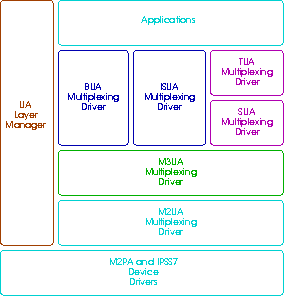 The M2UA project is to provide a Message Transfer Part (MTP) Level 2 User Adaptation Layer (M2UA) STREAMS multiplexing driver which will provide M2UA protocol modules. The IUA project is to provide an ISDN Q.921-User Adatpation Layer (IUA) STREAMS multiplexing driver which will provide IUA protocol modules. In addition the DPNSS/DASS 2 Extensions to the IUA Protocol (DUA), V5.2-User Adaptation Layer (V5UA), and GR-303 Extensions to the IUA Protocol (GR303UA) will be provided. The TALI project is to provide a Tekelec's Transport Adapter Layer Interface (TALI) STREAMS multiplexing driver which will provide TALI protocol modules. The UA Layer Manager is a project to provide configuration and management tools for the OpenSS7 SIGTRAN stack.